So I hadn’t mentioned this earlier, but I sent in an application for the next series of the Great British Bake Off. One day, I received a very interesting phone call – one of the people who works on the show; he asked me a few questions and then asked if I would like to come in for an in-person interview for the next round of auditions. Of course, I said yes!! I don’t know how I managed to stay so calm during my interview, I’m pretty sure I was speaking a mile a minute and I felt like my heart was going to burst out of my chest. As soon as I got off the phone, I ran back upstairs to my desk at work with a grin bigger than the Cheshire Cat’s. I was going to audition. I had been selected out of thousands of applicants to have a chance to prove my baking skills. I was given the instructions to bring some examples of my baking to show off my skills, and instantly my mind starting spinning – what should I make? I wanted something that would be a showstopper. Something that would represent me and my American-ness. Me and my Southern-ness. So I instantly thought to a recipe from Southern Living that I had been eyeing for some time – a chocolate gingerbread cake. The following weekend, I did a trial bake to take to work for feedback. After a few suggestions and a bit of tweaking, I think I nailed my final recipe. I ended up making this cake three times – once for work as a trial, once for the audition, and a third time for Christmas Eve dinner to share with my family (who are probably more excited at my prospect than I am, as they immediately started planning out plot lines and how they’d ‘spin’ my story on the show). Anyways, this cake does take a bit of time to prep and assemble. 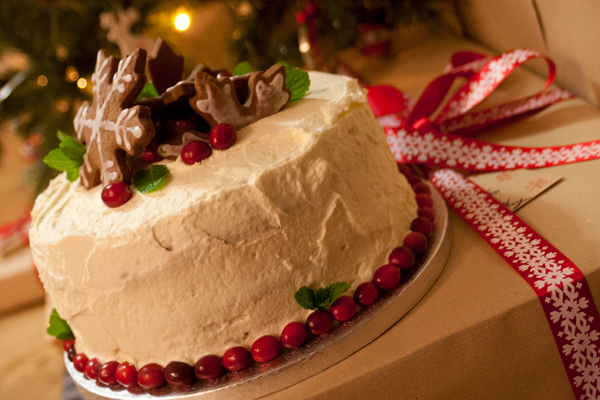 But it is worth it – it is so moist and delicious and it just looks and tastes like the holidays. Plus, the chocolate ganache and toffee layers in between the cakes are an extra decadent treat. The key is to take your time and try not to rush through. As far as Bake Off goes, I’m awaiting the results to see if I’m invited to the next round – but hopefully this cake impressed! So, bakers, keep your fingers crossed! 1. The night before you want to bake your cake, prepare the ginger whipped cream. In a small saucepan over medium-high heat, cook the cream and ginger for 3-5 minutes of just until bubbles appear. Be sure not to let the mixture boil. Remove from the heat and let cool to room temperature. Once cool, place in a container to chill in the fridge for at least 4 hours, but overnight would be best. The colder your cream, the better it will whip! 2. When you’re ready to bake your cake, preheat your oven to 350°F (175°C). Butter and line 3 round cake tins with parchment paper, then butter the parchment paper. Next, begin your cake batter microwaving your chocolate in a bowl in 30-second bursts until melted. Be sure to stir the chocolate in between bursts to make sure it doesn’t burn! 3. In the bowl of your electric mixer, beat the brown sugar and butter at medium speed until well blended. Add eggs one at a time, followed by the melted chocolate, beating until it’s just blended. 4. Sift together the flour, ginger, cinnamon, salt, allspice, and nutmeg. Gradually add this flour mixture to the chocolate mixture, alternating with the sour cream. Make sure to begin and end your additions with the flour mixture. Beat at a low speed until everything just comes together. Next, stir together the hot water with the black treacle/molasses as well as the baking soda (this mix will foam a bit). Gradually stir the molasses mixture into the rest of the batter, as well as adding in the vanilla. Once your mixture is blended together, spoon the batter evenly into your 3 prepared cake tins. 5. Bake the cakes for 25-30 minutes, or until a cake tester comes out clean. Cool the cakes in the pans on a wire rack for 10 minutes before turning out to cool completely (about an hour). 6. When the cakes are nearly cool, prepare your toffee mixture. In a glass bowl over simmering water, place your toffee pieces and butter together. Gently heat until the butter and candy begins to melt and become runny. You’ll need this to have a fairly runny consistency in order to spread over your cake. If you need to, you can add more butter or a bit of milk to help lighten the consistency. Once the toffee is melted, quickly spread a layer over the top of two of your cakes. Be careful not to work it too hard as it cools, because it can tear your cakes. 7. Next, make your chocolate ganache. Similar to the toffee, melt your chocolate pieces and salt in a bowl over simmering water. Once everything is melted, add in the sweetened condensed milk; cook for 1-2 minutes, stirring constantly until everything is smooth. Remove from the heat, then add in the butter and vanilla, stirring for 4-5 minutes until smooth. Let the ganache cool to room temperature before transferring to another bowl. Add in the cream and beat with a hand mixer on high speed until it reaches the consistency of buttercream. If you need to, you can add a bit of icing sugar to help with the consistency. Once it’s ready, spread the ganache over your toffee layers. 8. Once all of your cakes are toffee-d and ganache-d, layer them up so that the cake with nothing on it is the top layer. Then whip up your chilled ginger cream to make the frosting. Pour the cream through a fine mesh strainer to remove the ginger pieces. Beat with a hand mixer on high speed until the mixture starts to foam. Then add in your icing sugar and continue to mix on high speed until stiff peaks form. Use the whipped cream immediately and spread over your cake. 9. 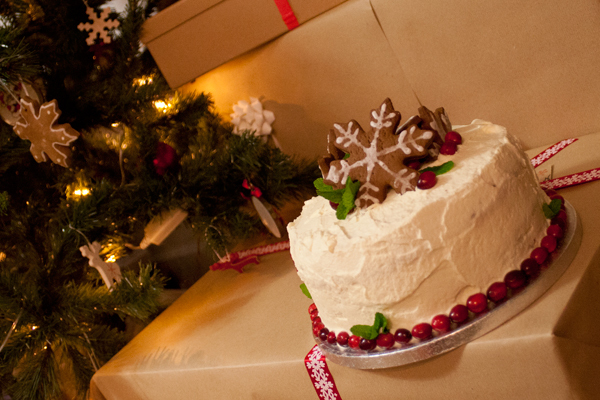 Finally, decorate your cake however you’d like using fresh gingerbread cookies, mint, and cranberries.